The most incorruptible in the world, the San Francisco court ordered biochemists to pay more than $ 289 million to former school gardener Lee Johnson, who developed an incurable malignant tumor from constant contact with the Monsanto herbicide- Roundup. The company will appeal the verdict. Do not you find anything surprising here? Amount of compensation? No, it's just in order: in the US, the amount of such payments is determined depending on the ability of the culprit, rather than on the plaintiff's needs. For Mr. Johnson, there probably is not now a big difference between a million and 289 million, whereas the culprit, the court believes, should be punished with extreme sensitivity. This is fundamentally different from Russian law enforcement practice, but for the US - the norm. It is interesting that in the related field of law the situation is different: alimony in both countries is appointed proceeding from the defendant's capabilities, and the plaintiff's financial position is almost invalid. What is right here is that you do not have to decide for yourself. The breakdown of compensation is as follows: 820 thousand for loss of income in the past, 1.4 million for loss of income now, 4 million for past "non-economic losses", 33 million - for future. And 250 million - "fine", a kind of analogue of "moral damage". It's almost exactly two-thirds of what the gardener's side asked. It's no secret that a court in the US is not so much a search for truth as a national sport, a contest of legal teams. Such a large-scale success of the claim became possible primarily due to the fact that a modest school gardener gathered around himself real stars, led by Robert F. Kennedy, Jr.. The representative of the famous family has never been an elected politician, but nevertheless this regular Kennedy is one of those people who can call any politician of the world and he will be listened to attentively. So an appreciable part of the giant compensation will go to the fees to those who have achieved it. But these people worked not only for the sake of money. They worked to get Monsanto to the maximum of trouble. Interesting is another. First, the motivation for the prosecution. Lee Johnson used "Roundup" for many years in large quantities 20-30 times a year. And twice the remedy fell on unprotected skin, and the plaintiff managed to prove that he had both consulted Monsanto for advice, but no one called him back. And then - lymphoma. And the court. And compensation. But "Roundup", the main active ingredient of which is glyphosate, has been used for forty years in the fight against weeds all over the world. It is freely sold in most countries. It is clear that over the past 40 years, many studies have been carried out. Of course, the professional gardener of the school district used serious equipment, including 150-gallon tanks - it is more than half a cubic meter. And yet it is strange that before this forty years the substance was used without any problems, and now this is the trouble. Another bright point is the combination of the company and the product. Monsanto's complex reputation is not built on fertilizers and herbicides, but on their opposite - the creation of genetically modified organisms, which, in theory, just do not need harmful chemical additives. But this company does not put all the eggs in one basket, it tries to be present everywhere: it develops and produces GMOs, pours weeds with herbicides, and especially persistent farmers who do not want to deal with dubious seeds, just sell mineral fertilizers. Indeed, in the conditions of a continuous increase in the population of the Earth, traditional agriculture has ceased to meet growing needs, there was a need to boost agriculture. The era of manure is a thing of the past, we have advanced technologies that you can not even tell which one is worse. One of these technologies, the newest trend, is promoted by American restaurateur Kimball Mask, brother of Ilon Mask. Deficiency of arable land, he proposes to compensate for the development of vertical agriculture - without soil, without sunlight, with a well-calculated delivery of nutrients to plant organisms under strict computer control. Somewhat older is the idea of point modification of the plant genome, which would make them more resistant to diseases and parasites, and would increase yields. 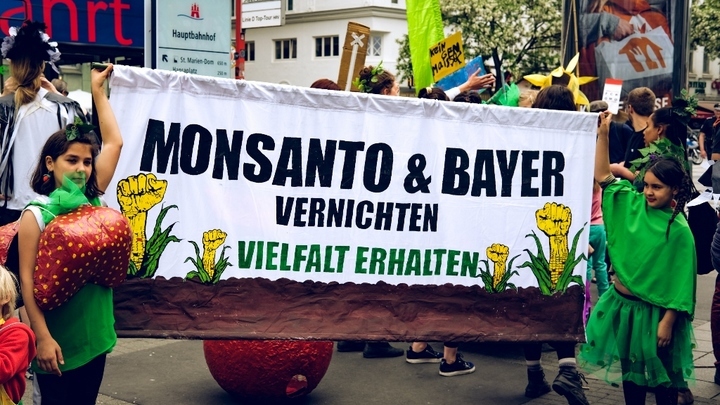 The most active conductor of the last path in the world is precisely Monsanto, which for 117 years of its existence has absorbed quite a few companies, and in 2018, it was nailed, like a boa constrictor on a hippopotamus, to the still-omnipotent German Bayer. The alliance of giants in GMOs and medicine - such a dramatic union did not foresee, probably, even Karl Marx, the author of extremely precise characteristics of the future monopolistic imperialism. Let's return to the unlucky gardener. To some extent, he was lucky, and even if he dies from cancer, he will not die in vain. Perhaps, it is with his case that a real attack on a transnational, transgenic company in her homeland will begin. Right now, it's not about money that matters, but about the principle of fighting a healthy conservative part of American society with its octopus devouring it. After all, the understanding that you can not jump above your head, that you can not demand more from the land than you deserve, is a very important point, the revision of the entire ideological paradigm. And at the next stage, perhaps, the lowercase letter will change to a capital letter, and the US will stop deceiving to demand more from the Earth than they deserve. We do not know if the gardener's lymphoma is really caused by the "Roundup" shower, but just in case, good luck, Mr. Johnson.